Old is the new new. Certainly, the “rediscovery” of forgotten women artists that has taken place in recent times has been productive. Most spectacularly, it gave us the re-emergence of Louise Bourgeois, who had been ignored for half a century, but then exploded into the 1990s as a Boadiceal standard-bearer for the feminine thrust in art. There was also Yayoi Kusama, with her relentless dots, and Alice Neel, with her eloquently awkward portraits. 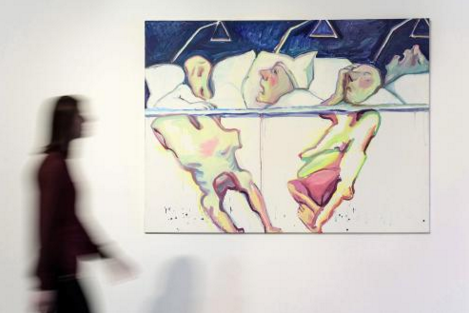 But next to Bourgeois in importance and impact, I would place Maria Lassnig (1919-2014). When I first saw her work, at the 2003 Venice Biennale, she was already in her eighties. How can an artist in her eighties be as punkish as this, I gasped? A few years later, a selection of her recent paintings appeared at the Serpentine Gallery in one of the best shows I have seen there. The fact that everything she produced was some kind of self-portraiture made it doubly impactful. 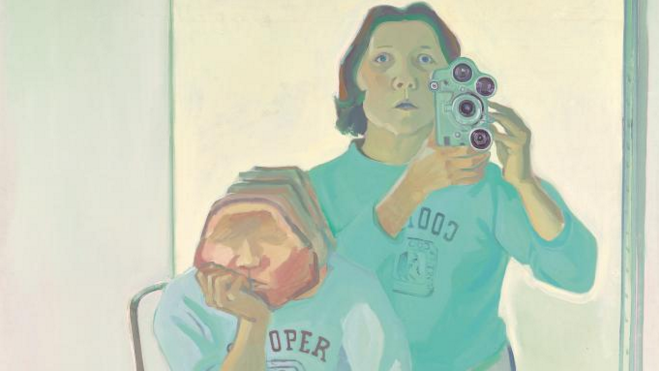 Who can forget the sight of Lassnig, in her mid-eighties, sitting naked with her legs apart, pointing a gun at us and another at herself, in the masterpiece of post-Freudian gunslingerism You or Me? I was looking forward to reacquainting myself with this spectacularly confrontational painting in the Lassnig retrospective that has opened at Tate Liverpool, but it’s not there. Instead, the show takes us on an action-packed journey through the rest of her output. The advantage of being noticed in your eighties is that so much of your back catalogue is waiting to be discovered; in this case, enough to fill several careers. The earliest picture, from 1945, the year she completed her studies at the Academy of Fine Arts in Vienna, is another especially confrontational piece of You and Me-ism, painted loosely with jagged Germanic brushstrokes. It shows her staring at us with exceptional directness. In her left hand, she holds a brush that might as well be a knife, so forcefully is it thrust towards us. This isn’t self-portraiture. This is jousting. At the other end of the show, in her last painting from 2010-13, she does it again. This time, the brush is held above her head in a slasher’s pose I’m pretty sure I recognise from that moment in Psycho when Norman’s “mother” attacks Janet Leigh in the shower. Lassnig was born in 1919 near Klagenfurt, Austria. Having recently spent time in the area, I can vouch for the fact that it is very quiet, very beautiful, very cut off and very Catholic. At every junction, on every hillock, a crucified Christ reminds you of His suffering. Her childhood was suitably unhappy, with a brutish dad who beat up her mum. You can see her singing about it with surprising chirpiness, dressed up in an assortment of ridiculous costumes, in a video she produced at the far end of her life, called The Ballad of Maria Lassnig. It’s telling, but also hilarious. When you’re old, embarrassment dies before you do. But the early darkness never really brightened. However good you are at drawing, if your life is fractured, your art will be fractured. And the Tate display is restless and jumpy, an impression heightened by the decision to go off piste with the chronology and present her work in self-contained clusters. She would change styles in response to a change in circumstances. It’s a bouncy journey. There is, though, a big unifier. All her art is about the human body — her body. It might not be obvious, as when she imagined what a chair might feel like when you sit down on it, but it is always central. The first paintings we see look like the handiwork of a newly discovered abstract expressionist, someone who studied under de Kooning in New York. They were actually painted in Paris in the 1960s, and were created by lying on the canvas and recording her outlines where they met the picture surface. So they’re instinctual, but specifically about her, and very beautiful: light of touch and dazzlingly coloured. 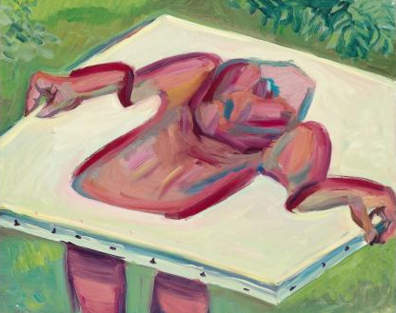 In the late 1960s, fed up with the neglect, Lassnig moved to New York, where she studied animation and learnt how to produce the entertaining videos that keep surprising us here. She wanted to work for Disney; instead, she turned her twisty thought processes into illustrated mind maps that take plenty of following. When you start making videos at 50, you’re not going to do what the kids do. Paradoxically, her paintings in New York became more legible as she entered a gloomy phase the show-makers have christened American realism. It’s definitely her body you see now, popping up twice in the same picture, once to take a photo and again to be in it. Or pulling a plastic bag over her head in an unsettling evocation of suffocation. This isn’t American realism. This is expressive Austrian surrealism, a suite of complex perception games made spookier by a green colour scheme inspired, apparently, by the doomy lighting in her apartment. Back in Austria, recognised at last, she returned to the brighter expressionist colour schemes of her youth. Lady with Brain (1990) features a grimacing face — hers — with a large blob of brain matter seeping out from the temple, as if the brain is repositioning itself outside the head. Lassnig is trying to paint herself as an entity that does not require reason or brainwork to exist: all it requires is a sense of self. The beautiful blue background that surrounds her reconfigured head reminded me of the wayside Madonnas in Klagenfurt. Their backgrounds are always angelic blue. The paintings that follow seem to find various bits of the body irrelevant. Her face is usually there, but not the back of her head or her arms or legs or thighs. What seems to be going on is that she is trying to paint how a body feels, not how it looks. On the outside, a body appears complete, but on the inside the sensations are fragmentary. It’s crazy thinking, from a crazy thinker, but the results are inventive, different and exciting. Best not to seek the shelter of rationality in the thunderously original journey presented here. Best to stand in the gale and allow the slaps to land.